There is no handier tool for self-understanding and personal growth than a daily journal. 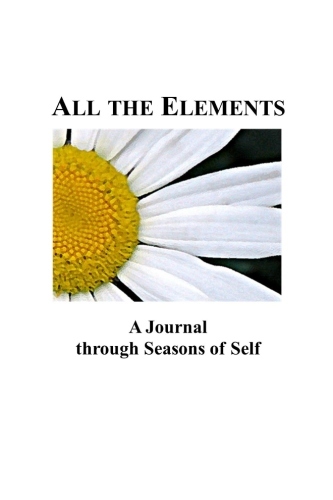 All the Elements: A Journal through the Seasons of Self is such a tool, organized for self-understanding and personal growth: to help you examine your life in depth, to awaken insight, and to guide you toward your true Self. All the Elements is my creation, a daily journal format rooted in Jungian psychology. All the Elements appeals to three levels of engagement. On the surface, it places no more expectation on you than keeping a record of your experiences and reflecting on them. A second level takes the process of reflection from one day to a week, then to weeks, and eventually across seasons into years. You pay particular attention to the rhythms and patterns, the larger cycles of your life. If you desire greater depth in your journal keeping, discover and explore the implications and urgings of this structured journal's design. If you do, you will be led into the wonderful workings of the psyche via the process of individuation, a third level. Psyche's root meaning is soul. When you use the third level of this journal format, you do soul work. The format of All the Elements draws upon a model of the mind's working devised by Carl Jung. Jung's psychological model describes a lifelong journey of the psyche he called individuation. In Memories, Dreams, and Reflections Jung related his own journey. All the Elements incorporates these three processes—memories, dreams, and reflections—in its design. When the conscious self (ego) is established at maturity, usually in the early twenties, a process begins whereby the contents of the unconscious exert an influence on the ego. Dreams and memories—spontaneous outpourings—access the unconscious. Projections also reveal unconscious aspects of the psyche. Jung determined that our emotion-laden perceptions of others (projections) reveal our often-repressed qualities. For example, the evil we see in someone else, particularly of the same gender, is our shadow projection reflected back to us. By recognizing the stirrings and urgings of the unconscious through dreams, memories, and projections and by incorporating them into the ego or conscious self, the ego expands but paradoxically becomes less self-ish. This is the process of individuation—a journey in anticipation of an authentic Self, an ever-achieved balance of the conscious and unconscious components of the psyche. Jung observed that Jesus and Buddha were cultural projections of the archetype of the Self— engaging examples of the possibility of a union of the ego, the personal unconscious, and the collective unconscious. This journal holds out the possibility that you may become your authentic Self through awareness and integration: the process of individuation. You will realize your integrity; and wonderfully you also become less egotistical. Optimism for the human condition—for you in particular—grounds this personal journal format. There is the beguiling possibility of Self, a compelling blend of your uniqueness and of the universal. You reach for that Self, though it will always exceed your grasp. You yearn for that wholeness, because (using Jung's metaphor) it is theGod-within. The reaching and the yearning take you deeper and deeper into personal authenticity and meaning. Your progress toward the Self—a journey of the psyche—is fundamental. It occurs naturally, but awareness and intention enhance the journey. It is a journey of adventure and realization. It is a journey toward balance and wholeness—the universal spiritual journey. There is no journey more wonderful or more important. A record of your days. Each day comes as a precious gift. Yet those days are so ordinary that we too easily lose them in the retreat and onrush of time. Contemporary life is an ever-accelerating tumult.Your journal entries are like souvenirs—beloved reminders—that you pause to gather and keep so you will not neglect or forget the preciousness of your days. And each day is a precious gift. Embedding you in the moment. When you keep a journal, you are generally more aware, because you've charged yourself to keep a record. The sections of All the Elements make particular demands on your awareness: weather, health and mood, events and relationships, and dreams and memories. Details and texture pop into clearer focus. Context becomes apparent. Journal keeping encourages the active form of meditation known as mindfulness. Centering. A journal gives you a sense of order and at least a semblance of control of your life. You focus on yourself, but you also see yourself in context, particularly through your many relationships. Such a vision allows you more easily to repose in your world with understanding and even serenity, though the demands of the world press upon you and time rushes you into the future. It is good to be centered in this fashion, in the midst of a demanding, hectic contemporary world. More memories and memories that are more accurate. We unconsciously forget much more than we ever consciously remember. What we do choose to remember is sometimes so processed as to be fabrications rather than facsimiles. A journal's record is a memory aid and a memory corrective. Relationships. A significant section of All the Elements pairs the events of your day with the engagements and encounters—the relationships—of those events. You are encouraged to register the connection or lack of connection you may experience. You have a relationship with yourself, with other persons, with your work and other aspects of your life, with nature, with the Divine. The quality and affect of your relationships reveal what Jung called projections.Relationships also have a transcendent quality that reveals the spirit that marbles Life; and they can take you toward the depth of existence. Accumulation of rhythms and patterns. When you review your daily journal entries, particularly as organized by the various sections of All the Elements, certain aspects of your life and world will seem to repeat or progress: a dream recurs; winter weather melts into spring's warmth; a particular relationship languishes; you continue to resolve to lose weight but fail to do so. Rhythms and patterns alert you to the seasons of nature, your world, as well as seasons of yourself. The weekly review section, titled "Rhythms and Patterns," encourages this vision. The seasonal format—a bound journal book is a season—furthers your attentiveness to rhythms and patterns that become larger cycles. Change and Growth. An accurate record of your days and ways inevitably reveals the changes that are always working around you and in you. When you recognize the constancy of change, it is natural to not only accept the changes but to direct them toward your aspirations and goals. Personal growth hinges on an acceptance of the reality of change in all aspects of existence. A daily record also alerts you to the harbingers of change. Commitment and Accountability. The seductions of the world are many, and we are culturally conditioned to be perpetually entertained. Many of us fear commitment. We tend to deny responsibility for our actions, especially by casting ourselves as victims of this or that influence. This journal insists that the "buck stops here," with you, the person who keeps the journal. If you are not honest, your journal silently but steadfastly admonishes you. Confession. Keeping a journal works only if you're honest. The one person you can never deceive is yourself. A journal's intimacy makes it easy to tell the truth, because truth telling is therapeutic. There are two sorts of confession. We generally see confession as coming clean— admitting to something negative. However, there is a more positive confession—baring the depths of your soul. Both are good for the spirit. Your journal is your conscience on paper. Discipline. Journal keeping requires commitment and steadfastness.There are days when you for one reason or another you will want to shirk from doing it. These are occasions that make or break the journal's many benefits. Journal keeping is a form of exercise to keep you mentally, emotionally, and spiritually fit. To maintain a healthful tone you do it especially when you don't feel like doing it. It is an end in itself, too—a dedication to Life and your life, that you sacrificedaily. (Sacrifice literally means to make sacred.) Through dedicated journal keeping, you realize the inherent sacredness of Life and your life. Creativity. You are a work in progress. A journal encourages your active engagement and participation in becoming your true Self. This is the surface creativity of keeping this structured journal. There is another level of creativity that relates to the art of writing. All the Elements has a large section, "Reflections," where you can process your day through your marvelous imagination. With daily practice, you will discover that writing unlocks creativity. Your life as written down in a journal is a kind of art. Spirituality. Spirituality animates religion. Spirituality—the emotion, the realization, and the imagination that merge into a unique consciousness—marbles every life. Intention and awareness brings such qualities to our consciousness. The attitude of mindfulness swells our grateful, reverent participation in Life. All the Elements'design emphasizes the journey toward the Self that Jung also called the God-within. Many find that keeping a journal illuminates a spiritual truth: the journey is, at least, as important as the journey's destination. The seasonal journal book has two facing pages for each day of that season. The paired pages have eight bordered spaces designated for recording specific aspects of a day. These eight spaces are relatively small—more suited to notes rather than longer expositions. Every seven days there is a page designated for the review of a week's worth of entries in discernment to patterns and rhythms. At the end of a season, there are pages (“Notes”) to reflect on the larger rhythms and patterns, the cycles—of your life. The structure of All the Elements encourages you to record aspects of your day and asks you to review and reflect on your entries. It will help you access and understand the archetypal images of your unconscious. As days accumulate into weeks and weeks into seasons, patterns and rhythms will emerge in time, with understanding, you may realize the meaning of your life as you repose in Life. You may also acquire the insight and will to grow into your authentic personality. A record of your everyday, ordinary relationships allows you to savor with happiness and gratitude the connections you do have.Your disconnects signify areas of your practical life that need attention. Ask yourself, "Why am I disconnected?" and also, "Whatcan I do to connect or reconnect?" It is possible for relationships to attain a mystical plateau, when the two partners in the relationship encounter the other partner in the other's fullness. Neither participant is objectified—turned into an object, a thing, or an it by the other participant. Such an occurrence is strange in a lyrical way and always brief. But it is a glimpse into an extraordinary level of reality. It can happen between two persons. It can come as individuality in the midst of humanity. It can occur with parts or the whole of Nature. The philosopher Martin Buber described the mystical possibilities of relationships in I and Thou. He said that a true relationship—an encounter rather than an experience—occurs outside of each participant. And he proposed that all such encounters intersect in the Divine—or the Eternal Thou. Don't lose sight of the simple truth of relationships fulfilling our need for one another. Hold out the possibility that relationships reveal the Divine—in whatever way you might construe the Treanscendent in Nature and Human Nature. And so I invite you to a one meeting seminar tomorrow night at 7:30 in the library on the second floor of the Religious Education Building.We’ll talk about journal keeping generally and All the Elements specifically. For those who took the Jungian types/Four Spiritualities seminar this January, this is a follow up. But anyone is welcome to attend and more, each will find this seminar a practical and effective means to deep understanding and personal growth. 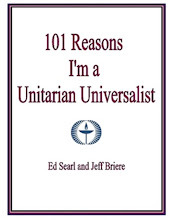 101, one-paragraph sketches offer Ed's and Jeff's personal approaches to Unitarian Universalism, while providing a sweeping perspective of two centuries and more of a living tradition both authors dearly love. They have crafted an accessible and entertaining collection. [see preview or buy at Amazon] New KINDLE edition. 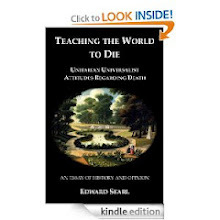 Edward Searl is minister of the Unitarian Church of Hinsdale, IL, where he's served since 1983. You may direct queries via email: edsearl@gmail.com.